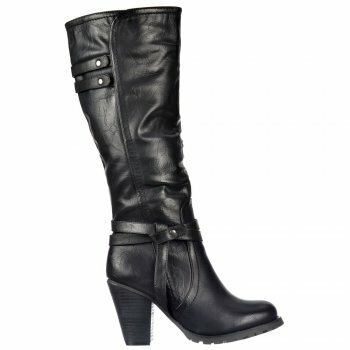 Rock the Biker Chick Look With these Stunning Knee High Boots Which Feature Straps and Stud Detail. Complete with Full Length Inner Zip for Easy On/Off and Stacked 3.5 inch Block Heel, They Are approx 14 inches Tall. These Boots Fit Easily into Both Your Daytime or Evening Wardrobe! Choice of Styles With or Without SKO Buckle to Lower Outer Boot.